Opinion (Roman Nosikov, lawyer, journalist): “How to be a man correctly. How to develop such a great human quality as maturity. The world of the future is a world of powerful children, the children who never grow up. The human being acquires maturity by dealing with difficulties, in fight against evil. But evil and difficulties, troubles and misfortunes do not exist in today’s world. “People do not understand how to respond to evil; they cannot even recognize it. People are engaged in free creativity, game, entertainment, powerful super-children. Humanity has forgotten about the dirt from which it has come. Humanity has turned into a child who does not care about the prose of life. Comment (the author’s opinions): The main thing is the process of turning an infantile, spoiled person into a real human being. The problem is that a person is not his world outlook, not his humanism, nationality and set of tastes and preferences. The human being is a connection with his own kind. The human being is not a point. The human being is a line connecting the points. Therefore, one cannot hide from people. This makes him less and less human. He begins to consider himself to be God. The human being is not what he thinks of himself. The human being is his connection with others, his love and its manifestations. From the Writings of Rabash, “The New Moon”: Malchut is called the moon, and it is called the new moon, the concept of the kingdom of heaven being that, we need to accept the yoke anew every day. Yesterday’s acceptance is not enough, because the holy Ari says that we need to raise the sparks that fell to BYA all the time, lifting them to holiness. It is found that a person takes on the yoke anew all the time, this being the name for his taking a portion of the separation and attaching it to spiritual unification. And this is the idea that Malchut returns to a point every day, this point being called a black point, which has no whiteness in the holy Zohar; that is, it doesn’t shine, for illumination is called whiteness, meaning that we must renew it all the time. If a person really nullifies himself to the group, respecting it and satisfying its desire by wanting to place the characteristic of bestowal and love into the connection between the friends, then to the degree of his effort, he sees how far he is from this condition. And if he strengthens his feeling that the greatness of this feeling is desirable, the distance brings him to despair due to his inability to reach this goal. But along with this, he understands how important the goal is and he gets the power to attain it. Eventually he completely realizes the nothingness of his powers. And here no person is as wise as someone with experience; it’s impossible to skip over this clarification. Only through the multitude of deeds, activities, and work that the Kabbalists recommend for us do we reach a state of despair. A state of despair also brings happiness. As Baal HaSulam writes, there is no happier moment in a person’s life than when he finds himself in despair of his own powers. For now he is ready to scream from the depths of his heart for a true prayer. He asks for the power to be nullified towards the group, for his entry into spiritual work depends on this. And then he receives this power, making it possible for him to nullify himself and adhere to the group. This is called the transformation of his black point into white. That is how he advances, and immediately he gets a new black point. And so from these points, one after another, he builds himself, transforming darkness into light all the time. That is how the moon is renewed. Until eventually, all of the entries and exits that constantly alternate one after the other build in him a state of smallness (Katnut). The spiritual fetus is finally formed and born, turning into a newborn. The fetus nullifies itself completely. All of its 613 desires pass through correction through nullification, and thanks to this he becomes “white,” reaching the level of Nefesh and is born into the new world. After birth, he continues to grow. His desire to receive grows more and more on the level of Ruach. There the person already must know how he joins with the actions of the Creator in that he takes part in the work of the Creator himself in order to start managing himself. This happens precisely with the same stages as the fetus develops in the physical world. Question: Do I annul myself only against my group or against any situation in life? Answer: Annulling occurs only against my group through which I view any situation in my life. After all, since I entered the spiritual work, I have only one goal in front of me: I have to cling to my friends in the group. I perceive and evaluate all situations in my life through the group: How much my problems help me by preventing my becoming included in the group and annulling myself before the group! I look only at this thing. Any situations in my life, any problems in the family, at work, or with my health I perceive as obstacles along my way of connecting with others in the perfect form and revealing the Creator between us. This is our ultimate goal. I evaluate everything only from this perspective. Then I can consider this picture of life as correct. I understand that everything comes from the Creator who paints my entire world for me in such a form. Question: How do we establish the state of the embryo and the womb it needs by the connection between us? Answer: It is a new phase in our development that has begun as a result of our progress. The stronger the connection between us, the more that can be revealed to you. After all, what I reveal to you is only for the sake of our future work. We see that the world is made of two forces, two halves: the internal part, which is me, and the external part, which is the group. Then the group becomes the internal part and the whole world becomes the external part. These waves spread and draw further and further away from the center. Thus you can establish more and more advanced forms of the spiritual embryo and the spiritual womb each time. First I was an embryo and the group was my womb. Then I and the group connect into one whole and become the embryo while everything that is around us becomes a womb, which is the greater group, which is all of humanity. The terms internal and external constantly expand. First I was considered the internal part and the group was the external part, then both the group and I became the internal part and all of humanity became the external part. It’s like levels that fold into one another. The whole world is divided into two parts: an internal part and an external part. 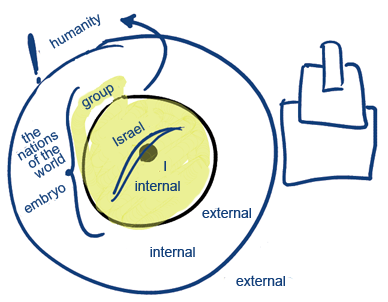 The internal part is called Israel and the external part is called the nations of the world. We have to constantly think about how to establish these concepts. We have to even establish the concept of humanity since now it has no form. If we reach a state in which we become a group, we become an embryo with regard to humanity that is supposed to be our womb, and we start to work with it. The spiritual embryo builds the womb by itself! After all, we ascend from the bottom up and establish the upper level by ourselves. Therefore, the Creator is called Bore, is called “come and see” (Bo-Re). We have to establish both the form of humanity and the Creator by our work from the bottom up. We must constantly keep this picture of the world. It has to become our constant perception of reality, the image of life, our philosophy, the glasses through which we see the world. When I am in the group, I perceive myself with regard to the group. However, when I go out to disseminate, I perceive myself together with the group with regard to all of humanity. Question: What is the benefit of discovering the Creator? Answer: If we were not to feel a desire to live, to receive pleasure, understanding, knowledge, and to improve our condition, then even this question would not exist. I require the Creator for my own good. Question: But this cannot be the ultimate goal. Answer: Why not? I am a desire to receive; I have nothing more than this. Therefore, I am not ready to wish for anything besides good and plenty. And so by searching for the most good, I discover that there exists a source for the good, the Creator or the Light. Apparently I am built such that the best state for me is when He fills me. Here is where the game begins, why am I filled? Am I filled so it will be good for me or so that it will be good for the Creator? Suppose that I am doing this for my own sake. In that case my fulfillment will be very small. I will be just like an infant that is satisfied and full, lying down without moving, full of pleasure. This is because all movement is a search for pleasure and in this state he lacks nothing. Even the still is above this; it protects itself, and here even protection is superfluous. The Creator doesn’t want us to be in this state, for this is a very small level. Therefore, He arranges everything so that we will not be satisfied with fulfillment of the self; rather, it is so that we can fulfill Him, as if He needed it. More precisely, we can be fulfilled for His sake. This adds more and more endless new fulfillments to us all the time, and as a result of this, we feel alive. You feel a little hunger and a little satiation, and again hunger and satiation, and so on, again and again. That is the way life flows all the time and you don’t freeze, you don’t stop on the primitive level of self-satisfaction that fills you up to the end without leaving any deficiency. On the other hand, if the Malchut of Infinity had not made a restriction (Tzimtzum) and had filled all of the vessels to the end, it would disappear and return to the beginning point of something from nothing (Yesh mi Ain). For this reason, the Creator created everything in such a form that we must be like Him, become someone who bestows. While we are a desire to receive, at the same time, we want to bestow and we “oscillate” between reception and bestowal, constantly increasing the range. This gives us the opportunity for limitless development and with it we feel an adventure, true pleasure. We enjoy both hunger and filling, for from the start even our hunger is directed towards the good of the other. Therefore, I enjoy love from two sides, both from the side of Din (judgment) and from the side of Rachamim (mercy). Question: How can one truly want this? Answer: These distinctions arrive with the help of the Light. It illuminates us to the degree of our accommodation to it, to the degree that we resemble it. And we begin to resemble it with the help of work with the friends in a group. Try to help them and you will feel the resistance. Don’t agree with this resistance in order to bestow to them, and then to the degree of your effort, you will awaken the Light that Reforms. Baal HaSulam, “Introduction to The Book of Zohar,” Item 203: …Since fear is a Mitzva that contains all the Mitzvot in the Torah, as it is the gate of the faith in the Creator. And according to the awakening of one’s fear, the faith in the Creator’s guidance is in him. Hence, the fear must not be forgotten in each and every Mitzva. It is especially so with the Mitzva of love, meaning that fear must be evoked along with it, since the fear is actually united in the Mitzva of love. This is why he explains that the fear must adhere to love. And how does it adhere to it? Should fear also be evoked at that time as one evokes the complete love? Must we even awaken fear at that time when complete love is awakened? Here he repeats the two sides of love, whether in Din or Hesed, and the success of his ways. He says that one must evoke fear on both sides of love, that during the Hesed and success of one’s ways, fear of the Creator should be evoked, lest the sin will cause his love of the Creator to chill. By that, he includes fear in love. The Mitzva of fear is not terror and fear of the Creator; rather, it is fear that I don’t love Him strongly enough. In other words, I am not afraid of Him; we are not talking about this. Fear like this exists only below the Machsom, below the spiritual world. And only levels of love are found above the Machsom. I am not afraid of the Creator and I am going towards Him. But I am afraid that my love for Him will not be great enough because I might become confused and make a mistake. That is, this is fear of judgment, of punishment. Fear like this doesn’t exist in spirituality because I have already risen above beastly fear. Rather I am afraid of giving him less satisfaction than what is possible. This is the only fear. I am always afraid that I will not love the Creator with complete love; perhaps it’s possible to give Him something further and I will not do this, I will not notice an opportunity, I will not be sensitive enough. Fear like this is a mechanism for increasing the love and for ascent on the entire ladder of levels. We go half of the way acquiring fear to the level of Bina. And after that, there are levels of love, and in this second half of the way, we feel twice the fear. But as is understood, this fear will never be egoistic as it is under the Machsom, for their own welfare. Fear will always be in regard to the one who is loved. Also, on the other side of love, during the harsh Din, he should evoke fear of the Creator and not harden his heart or stray his mind from the Din. By that, he includes the fear in love, as well. If he does so, he is always in complete love, as it should be. In regard to the integration of fear in love on the side of Hesed he brings the verse, “Happy is he who is always fearful.” He explains the word “always” to mean that even when the Creator treats him favorably, he should fear Him lest he will cause the sin. This raises the question, how is it possible to be in fear all the time? Of course, this fear is not egoistic, but is above the ego. It’s necessary to be afraid all the time, meaning to search for what else I can add to my love so as not to detract from it. If we were to behave this way in our world, in relationships between people, in the family, then our lives would be wonderful! When a person begs for mercy for himself, he is in a desire to receive and thinks only about himself. And the more that he prays for himself and tries to influence the Creator to improve his personal situation, not only does he not come close to the Creator, but also he moves away from Him, through awakening greater and greater egoism. All of our thoughts in every circumstance go to the Creator, for we are found in a single system; we are embedded in it. It’s impossible to think about something, to decide something, and to do something without influencing the entire system, for from the start we are found in it with every cell in our body and with our heart, with all our thoughts and desires. Before we even begin to understand what we are thinking about and what we want, this has already gone into the system! We are already within it! And that is how it is for every person, all people in the world, all the still, vegetative, and animate nature, everything! It’s only with the human that a completely different account is made, for we have been given the possibility of influencing the system through choice. Therefore, when a person’s thoughts are directed towards himself, then the system is influenced negatively. And if he continues to pray for himself, with this he invites a terrible negative awakening from the entire creation. The clearest discovery of ego is in this, when a person wants the Creator to do something for him according to his personal understanding and desire without realizing that the Creator gives him the best possibilities for correction at every moment. So it’s not just that he has an effect on the entire system, rather he arouses immense upheavals in it, causing it to move backwards against the tendency towards the goal of creation that was activated in the form of the evolution of all of humanity. The moment that a person revives and begins to think: “Me, world, creature, Creator, my condition,” he must direct himself first towards a connection with the Creator through the group. Otherwise, all of his influence on the system of creation will be negative, and first and foremost, he will cause his personal movement to be backward. So the best starting point for everyone is the constant transmission of bestowal through the group on all that is around us. This is called the “prayer of the many” because we are asking on behalf of the many. Such a prayer doesn’t indicate that many must be gathered together, there is no importance in this. One person is enough, only he should ask for many in such a way that he can ask for them as he would for himself. And “many” is at least ten. And then the influence of the person on the system will be positive and with it the Creator will be revealed. This is a very simple general rule. The Torah, “Exodus,” Ki Tisa, 32:25 – 32:27 And Moses saw the people, that they were exposed, for Aaron had exposed them to be disgraced before their adversaries. So Moses stood in the gate of the camp and said: “Whoever is for the Lord, [let him come] to me!” And all the sons of Levi gathered around him. “…every man kill his brother, every man his friend, every man his kinsman” stands for ridding oneself of the properties, habits, desires, hopes, and memories that one cherishes the most, i.e. letting go of the core of one’s entire life and universe. One has to part with these notions forever, “shut them down,” internally restrict them, and then gradually correct other qualities. “And all the sons of Levi gathered around him” refers to people or to certain human qualities that have to “stand out” (become obvious) from the point of view of the internal part of the Torah. Question: Then, why did the sons of Levi take part in the creation of the golden calf? Answer: It happened because there was no Moses, no illumination of the Upper Light on Malchut. When the Light influences Malchut, the properties that are ingrained in it rise. In other words, the Levites approach Moses; whereas, if the Light doesn’t descend to Malchut, the Levites stay under the influence of Malchut’s power of egoism. The Levites have no choice of their own. It applies solely to Mose’s governance that descends through every part of the system to the people. That’s why Aaron, the Cohens, and the Levites are only “adapters” that connect Moses with the people.